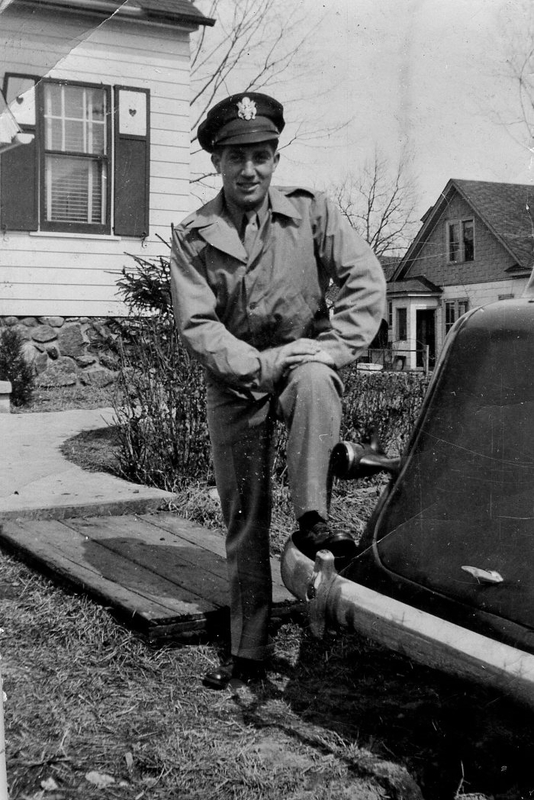 John Joseph DeFrancesco, pilot with the 544th Bomb Squad. Photo courtesy of John DeFrancesco. If you recall my post from last week, I recently spent an enjoyable weekend in Savannah with my three Stalag Luft IV sisters, Ellen Weaver, Candy Brown, and Laura Edge, and 384th Bomb Group veteran, John DeFrancesco. The better I get to know John, the more I am in awe of him and the other boys who served in the 384th and other Bomb Groups of the 8th Air Force in WWII. Most of the boys were just that – boys who had just finished high school or maybe had a couple of years of college. And here they were, fighting a war on foreign soil, defending our freedom, some of them dying for us. A very big responsibility for such young men. 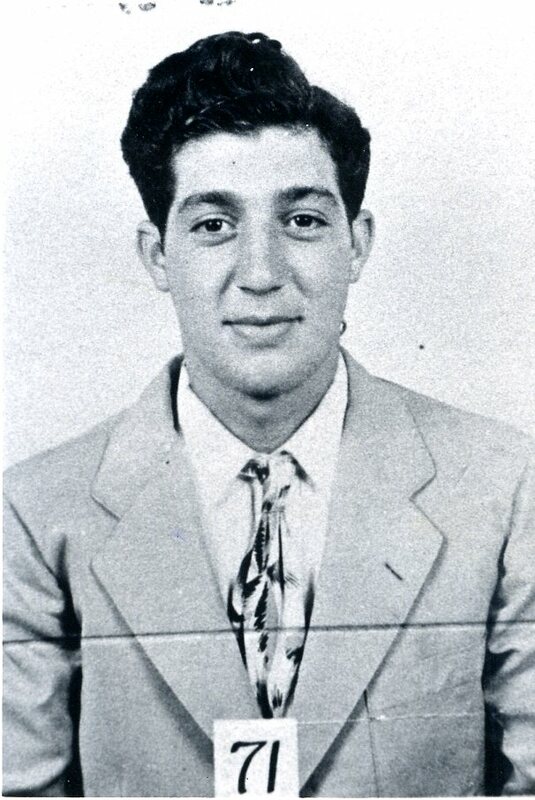 John Joseph DeFrancesco enlisted just a couple of months after graduating from high school. 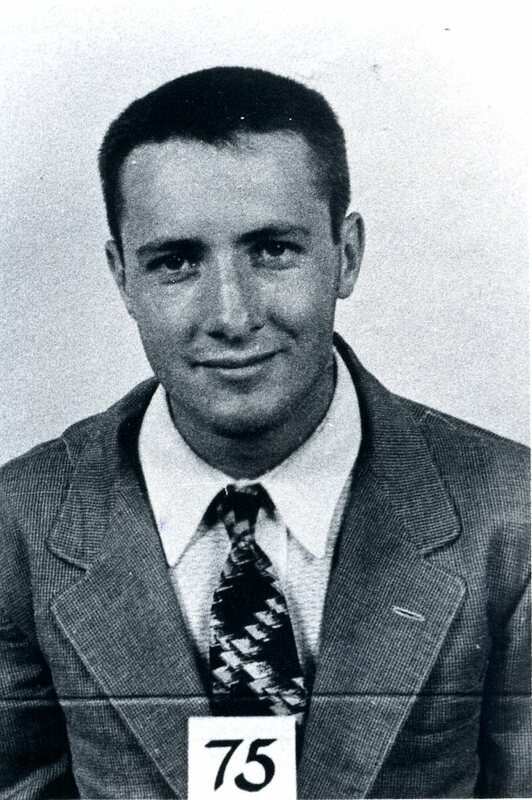 He was just eighteen years old when he enlisted, but despite his young age, he was selected for the aviation cadet program and was soon on his way to becoming a pilot. No, he had never flown before, but growing up he loved looking up to the sky when he heard the sound of an aircraft engine overhead and delighted in watching them in flight. That led him to choose the Army Air Forces for his military career. 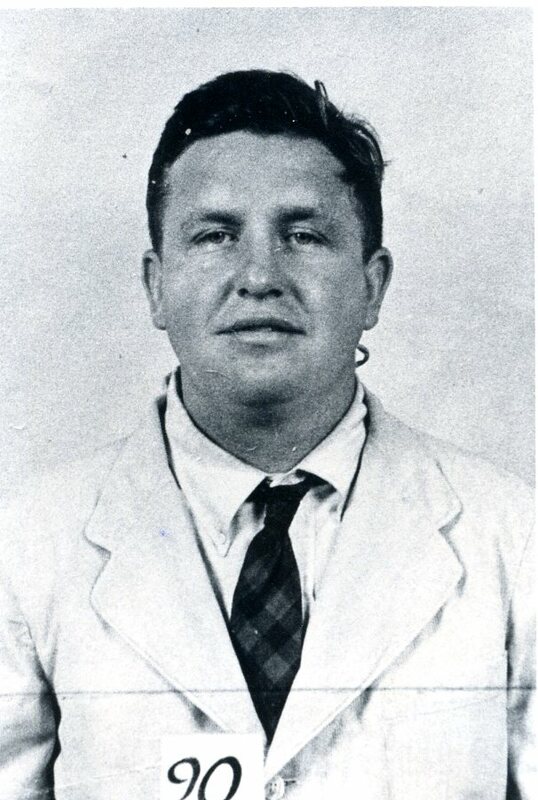 John DeFrancesco’s Personnel Data. 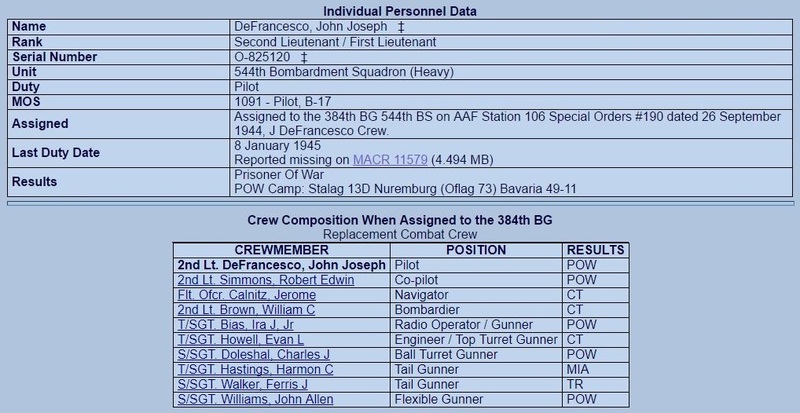 Edited screenshot from 384thBombGroup.com. John does not possess a full crew photo, but he does still have the escape/evasion photos of most of his crew. Escape/evasion photos were taken to assist a crewman who was able to escape or evade capture in the event he found himself bailing out of his B-17 and landing in hostile territory. 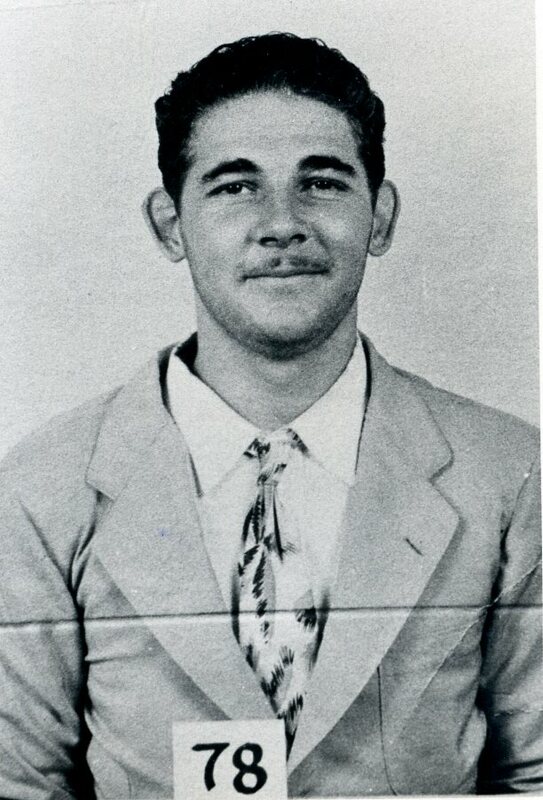 Escape/evasion photo for John Joseph DeFrancesco, Pilot, 544th Bomb Squadron. Photo courtesy of John DeFrancesco. 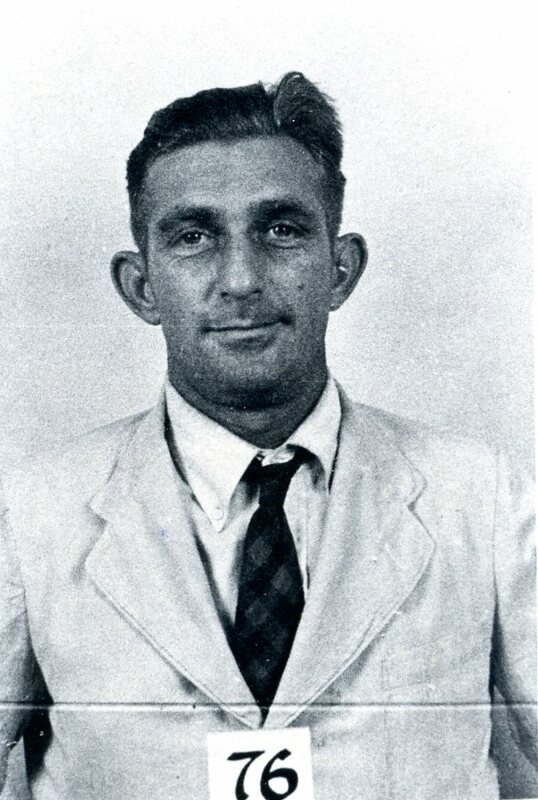 Escape/evasion photo for John DeFrancesco crewmember Robert Edwin Simmons (Co-pilot). Photo courtesy of John DeFrancesco. Escape/evasion photo for John DeFrancesco crewmember Ira J. Bias, Jr. (Radio Operator). Photo courtesy of John DeFrancesco. Escape/evasion photo for John DeFrancesco crewmember Evan L. (Dixie) Howell (Engineer/Top Turret Gunner). Photo courtesy of John DeFrancesco. Escape/evasion photo for John DeFrancesco crewmember Charles J. Doleshal (Ball Turret Gunner). Photo courtesy of John DeFrancesco. Escape/evasion photo for John DeFrancesco crewmember Harmon C. Hastings (Tail Gunner/Flexible Gunner). Photo courtesy of John DeFrancesco. Escape/evasion photo for John DeFrancesco crewmember Ferris J. Walker (Tail Gunner). Photo courtesy of John DeFrancesco. Escape/evasion photo for John DeFrancesco crewmember John (Johnny) Allen Williams (Flexible Gunner). Photo courtesy of John DeFrancesco. 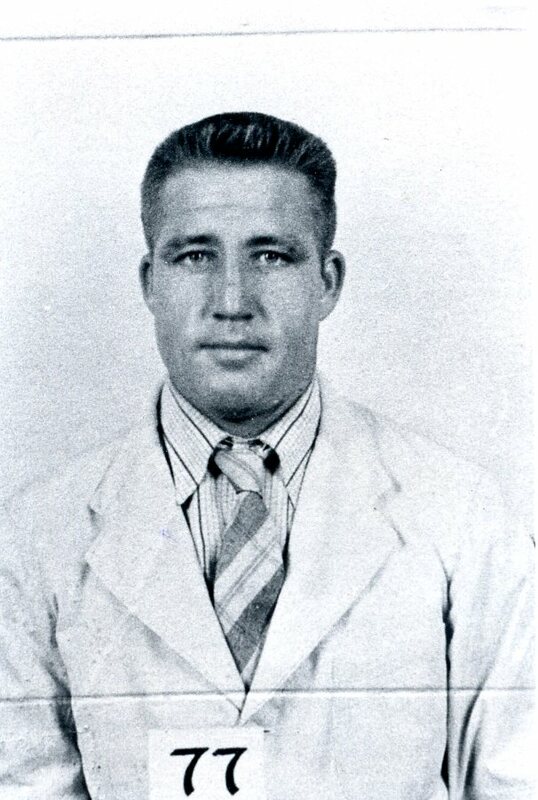 There were a few other men who John DeFrancesco served with on a number of missions. He flew with William E. Moon (no photo available) of the James W. Orr crew on twenty-one missions. Moon was originally a bombardier who retrained as a navigator. 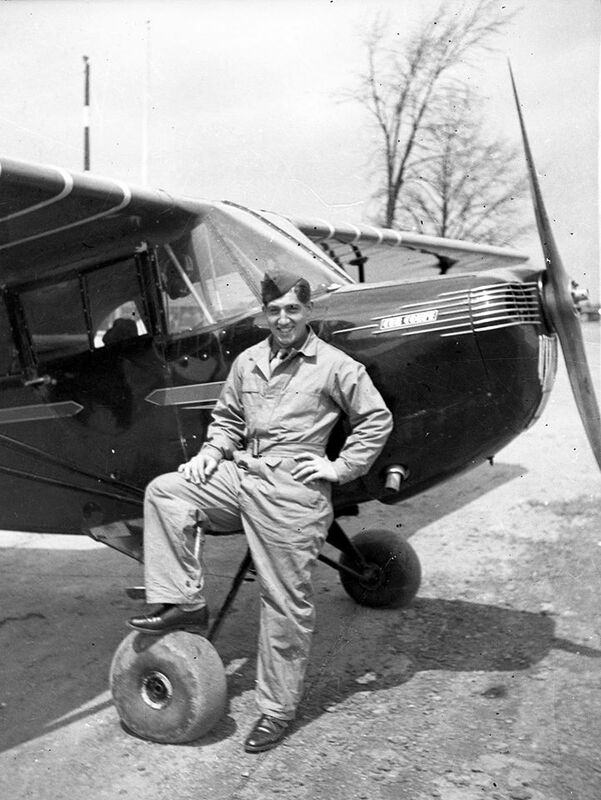 John flew with Homer L. Lott of the James Robson Gilmore crew on eleven missions. Lott was a flexible gunner turned togglier and flew with John on the January 8, 1945 mission on which both me became POWs. 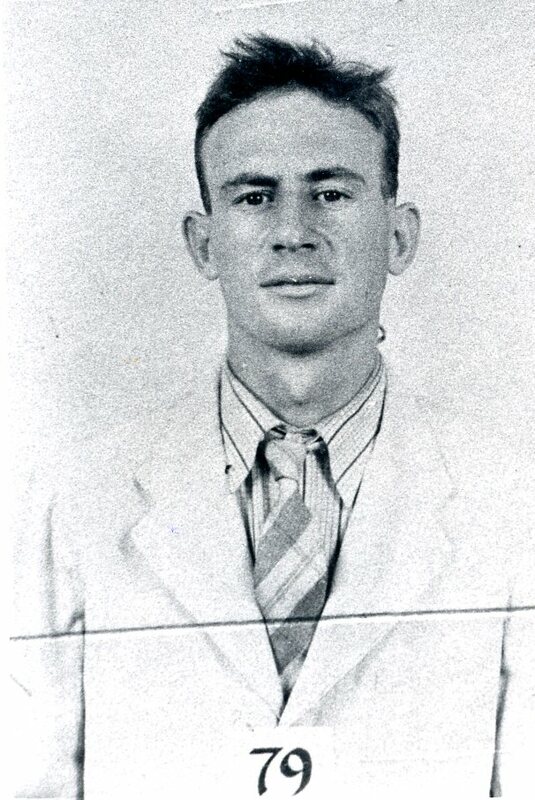 Homer L. Lott of the James Robson Gilmore Crew, 384th Bomb Group. Photo posted on Ancestry.com. 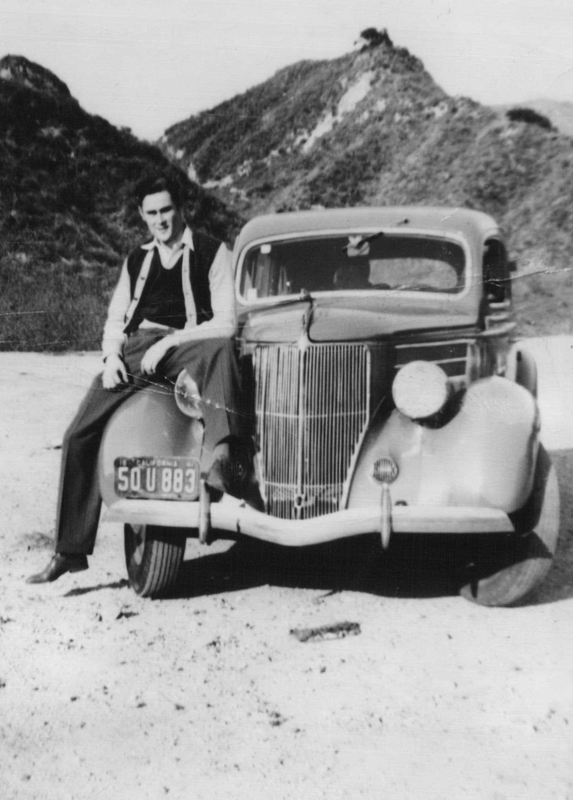 John DeFrancesco’s sixth mission on October 18, 1944, target Ford Motor Works in Cologne, Germany, was a memorable one. As the bombardier bent over the bomb sight, a piece of flak smashed through the Plexiglass nose of their B-17. It flew over the bombardier’s head and struck the navigator on that flight, Jack Lyons, in the arm, tearing away a large chunk of flesh and shattering his arm. The piece of flak continued through the aircraft and came through the floor of the cockpit, lodging under his pilot’s seat. 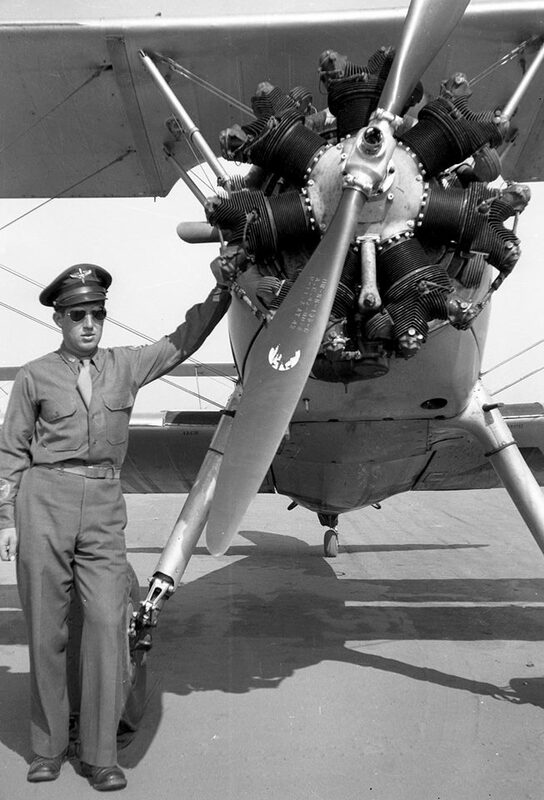 With other crew members unsuccessful in their attempts to aid Lt. Lyons, John turned the controls over to his co-pilot and went to Lt. Lyons’ aid in the nose. He cut the sleeve off Lt. Lyons’ jacket, formed it into a bandage, and applied it to the wound to stop the flow of blood. John’s actions saved the life of Jack Lyons, as without John’s help, Jack would have bled to death before they returned to their base at Grafton Underwood. 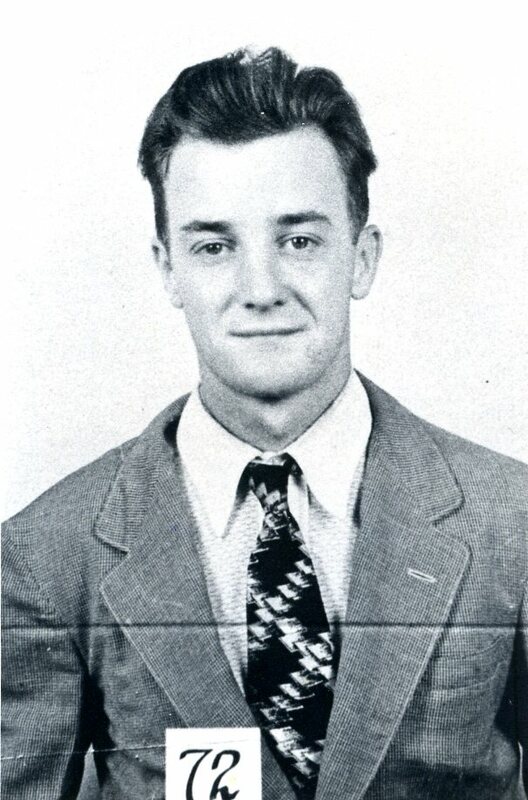 With Lt. Lyons stable, John returned to the cockpit and assumed the controls of the aircraft, bringing navigator Jack Lyons home alive. 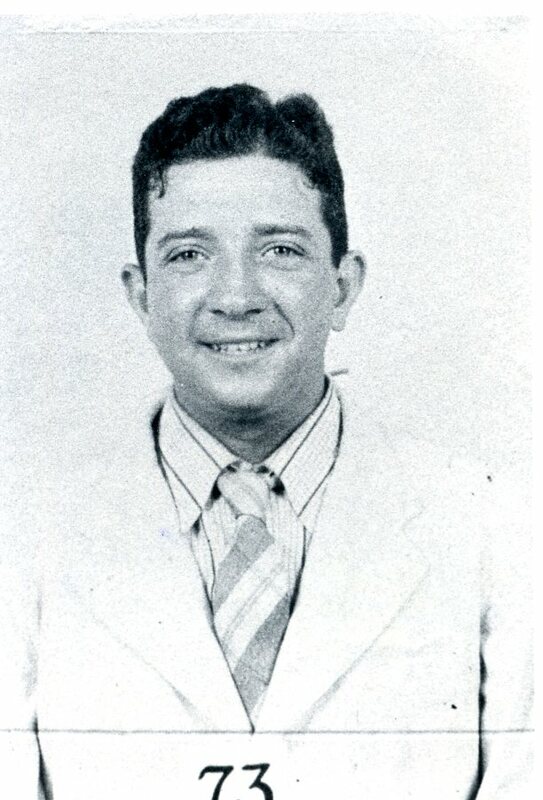 John DeFrancesco became a POW on his thirty-fifth mission and served 144 days as a POW in Germany in the prison camps Stalag 13D (Nuremburg) and Stalag 7A (Moosburg). The story of John’s thirty-fifth mission will be the subject of a future post. After WWII, John DeFrancesco served in the Air Force Active Reserves from 1945 until the late 1960’s when he went into the Inactive Reserves. In 1984, John retired from the military as a Lieutenant Colonel. 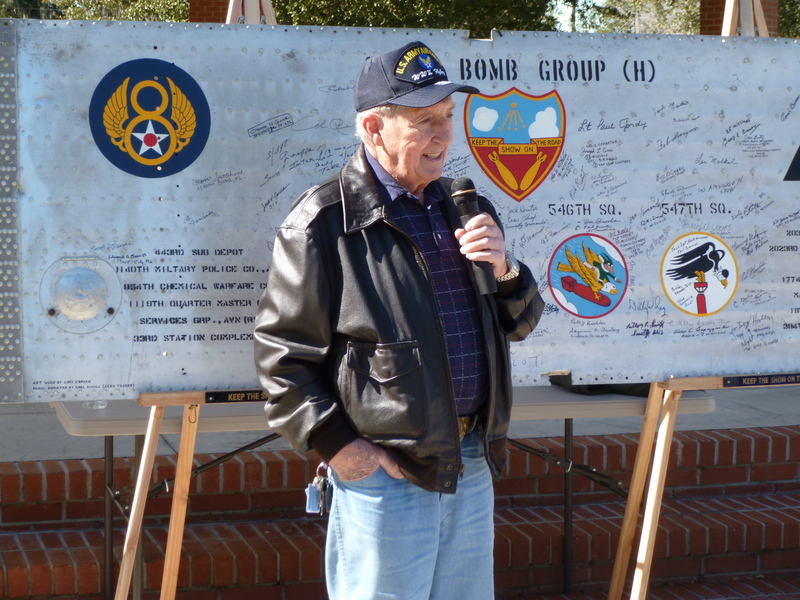 In 2014, John DeFrancesco signed the 384th Bomb Group’s Commemorative Wing Panel. I was honored to attend his signing and meet him and 384th Bomb Group armorer Paul Bureau that day. 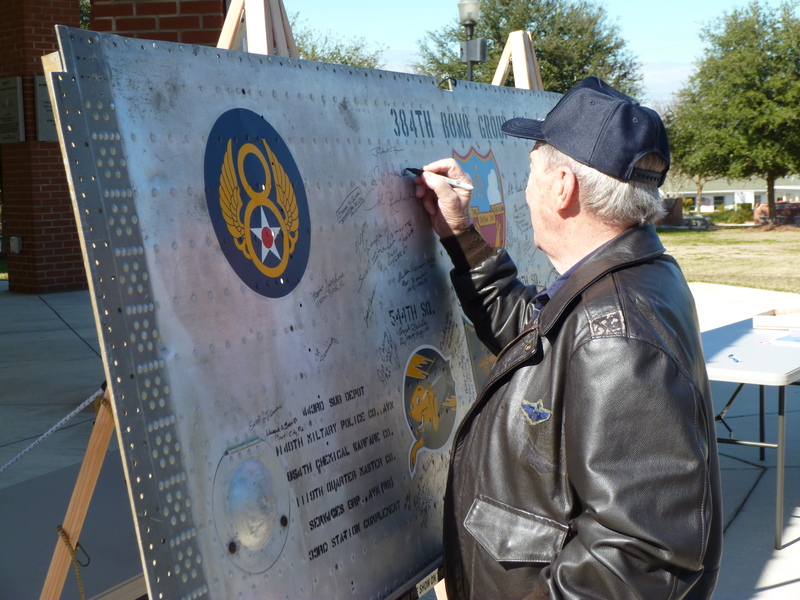 John DeFrancesco signs the 384th Bomb Group Wing Panel, 2014. Photo courtesy of 384thBombGroup.com. John DeFrancesco addresses the audience at his 384th Bomb Group Wing Panel Signing, 2014. Photo courtesy of 384thBombGroup.com. John’s thirty-fifth mission with the 384th Bomb Group and his time as a prisoner of war in Germany. By thearrowheadclub in 544th Bombardment Squadron (Heavy) on July 19, 2017 . Very cool reading. I worked with John for about 10 years while he was in his 80s. He worked as a CAD draftsman/designer and only retired when his wife, Jill, became too sick to leave alone. He is the most unflappable person I have ever met. I want to be just like him when I grow up. Thank you. John is my hero.